Music and spirituality shape the architecture for the East Preston United Baptist Church as it curves out of its landscape. 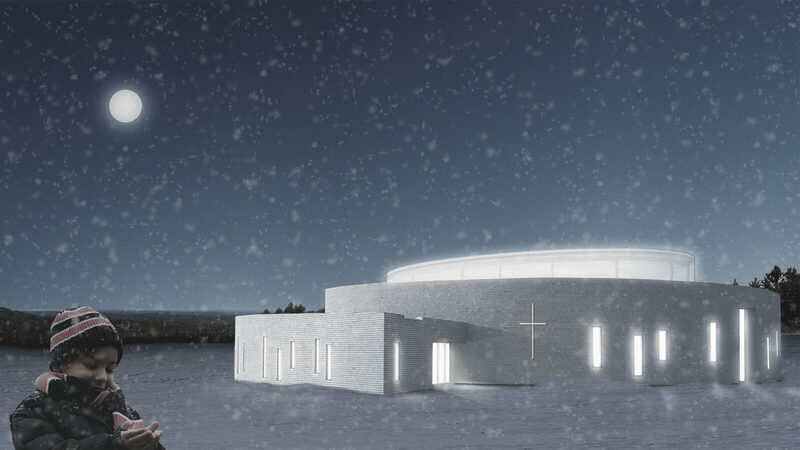 The project gathers the program spaces around a central daylight filled sanctuary. The clerestory glass around the perimeter of the sanctuary quietly monitors the passage of time and the seasons with the ever-changing light captured on the interior walls. The sanctuary focuses on the raised stage for music and the baptismal pool. Praise revolves around music and singing, with full submersion baptism signifying the most sacred act of belonging and commitment to the church community. The structure is articulated in the sanctuary and creates much of the beauty of this curved, top-lit space. The acoustical strategy is also expressed in this space. The convex and concave scalloped form of the sanctuary has been calculated to either absorb or scatter the sound depending on the location. The room has essentially been tuned for musical praise.